If you’re fortunate enough to purchase one of the ten Sal Paone custom homes planned for Maple Glen Court in Upper Dublin, we promise you will never be bored. 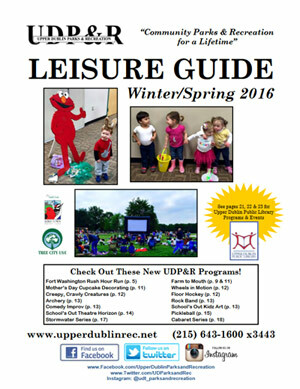 That because the Upper Dublin Parks and Recreation crew have put together their 2016 Leisure Guide, with info about the awesome array of activities available through the township for kids, teens, adults and seniors of all ages and interests. While we didn’t actually count to see if there are 1001 things included , that number may not be far off. Upper Dublin residents can enjoy arts, crafts, sports, fitness classes and events, movies, flea markets, theater, engineering activities for kids, trips, tours, bird watching, book groups, genealogy classes and so much more. Take a few hours and read through the Leisure Guide. Then, make a beeline to the Paone website to learn more about the wonderful and luxurious amenities homes planned for Maple Glen Court! This entry was posted on Wednesday, May 11th, 2016 at 2:00 pm and is filed under Maple Glenn Court. You can follow any responses to this entry through the RSS 2.0 feed. You can leave a response, or trackback from your own site.